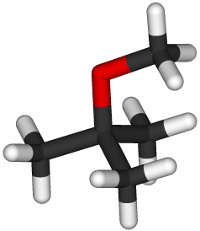 A 3D model of a MTBE molecule. Methyl tertiary-butyl ether (or MTBE) is a chemical compound mainly used as an additive for gasoline. MTBE raises the level of oxygen in gasoline so that it can burn more efficiently. It also decreases damage caused by engine knocking. MTBE makes its way into our drinking water from leaking fuel storage tanks and fuel lines. It can be tasted and gives off a turpentine-like odor in concentrations greater than 5 micrograms per liter. The World Health Organization believes that low exposure to MTBE is not cancer-causing in humans. Long-term exposure, however, has a much higher potential for cancer-related health risks. In early 2004, California and New York (which accounted for 40% of MTBE consumption in the United States) initiated a ban of its use. By 2005, twenty-five states had signed legislative bans on MTBE. As of 2006, there are still hundreds of pending lawsuits over the MTBE contamination of public and private drinking water supplies.